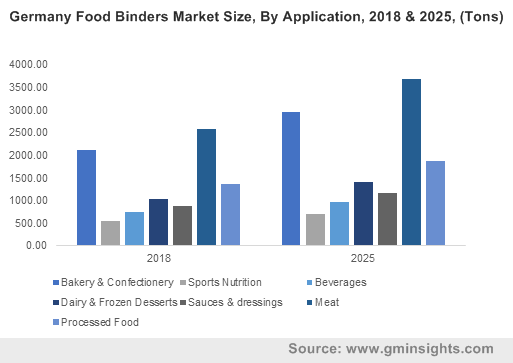 Food Binders Market size was over USD 1.2 billion in 2018 and industry expects demand of above 200 kilo tons by 2025. Growing demand of packaged and ready to eat edible products due to increasing disposable incomes and changing lifestyle will fortify binding agents’ utilization in food & beverage industry. The product owing to its texture & viscosity improving properties finds its applications in several processed edible products including cheese, candies, jellies, and jams. This will have a positive impact on the market growth. Food binders owing to their cohesive nature are added to sports supplements and liquid formulations. Binding agents help to hold together tablet constituents and liquid formulations. Athletes are the major consumers of sports supplements. Global sports supplements market is expected to witness substantial gains over 8.0% by 2025. Increase in number of fitness centres and health clubs owing to growing health awareness will positively impact nutraceutical industry which will further boost the global market growth. Food binders including egg white, agar agar, and corn starch are widely used in bakery and confectionary. Egg whites owing to foaming properties are added to cakes to make batter fluffy. Global cake market is expected to witness substantial gains over 3.0% in the estimated timeframe. Agar agar functions as a binding agent and provides a semi solid shape to candies and jellies enhancing the overall market size. Gums including xanthan gum and agar agar are added to sauces & dressing owing to their adhesive properties. The product also helps to achieve required consistency in sauces & dressings. Global mayonnaise market is expected to witness substantial gains up to 4.0% by 2023. Growing consumption of fast food will foster mayonnaise utilization which will boost global market growth. Xanthan gums are utilized as a baking ingredient in gluten free products to provide gluten properties in them. The product provides slippery environment in human’s gut which kills healthy bacteria present in the gut. These factors lead to irritable bowel syndrome and other autoimmune diseases. Negative health effects of these gums may hamper industry profitability and food binders market price trends. Global plant based food binders market may exceed 130 kilo tons by 2025. Plant based binding agents including starch and hydrocolloids are extracted from stems, leaves, seeds, & roots of plants and are added to processed edible products. These are mixed to breads and pastries due to their binding and volume enhancing properties. Increasing bread consumption due to changing consumer preferences and busy lifestyles will foster product demand. Global hydrocolloids based food binders market is expected to gain up to 4.5% in the forecasted timeline. Hydrocolloids are added to edible products owing to their water binding properties. The product includes xanthan gum, guar gum, agar agar, pectin, carrageenan & cellulose gum which have applications in jellies, jams, candies, cakes, and creams. Rising demand for new jelly flavours will fortify jelly and jam market which will escalate binding agents industry growth. Global pectin based food binders market may exceed USD 170 million by 2025. The product owing to its stabilizing and gelating properties is added to cheese, jams, cakes, and fruit juice powder. The product prevents cake hardening and helps to improve cheese quality. Rising cheese demand due to its diverse applications for pizza, pasta, sandwich, and noodles will foster food binders industry growth. Global whey based food binders is expected to gain up to 4.5% in the forecasted timeline. Whey functions as a binder in meat products, soups, stews, dry mixes, confectionary, and beverages due to its bonding properties. Growing demand of dry mix market owing to rising convenience edible products consumption will positively impact food binders industry size. Food binders industry from meat products application is predicted to exceed USD 665 million by 2025. The product helps to retain water due to its affinity for liquid content hence preventing fat clumping. Growing demand of meat products owing to their high protein content will foster binding agents industry growth. Food binders market size from processed food application is expected to gain up to 5% in the forecasted timeline. Potato starch owing to its neutral taste, volume enhancing, and strong binding properties is widely added to several processed food including packaged desserts, grated cheese, hot dogs, chips, and instant soups. Increasing demand of packaged edible products due to hectic work schedules and changing lifestyle will boost potato starch demand, thus escalating industry growth. Food binders market size from sauce & dressings application is predicted to exceed USD 155 million by 2025. Binding agents including agar agar, xanthan gum, and gelatin owing to its cohesive properties are utilized for making sauces and dressings. Extensive utilization of sauces to make various cuisines including Chinese, continental, and Italian will enhance binding agents industry size. 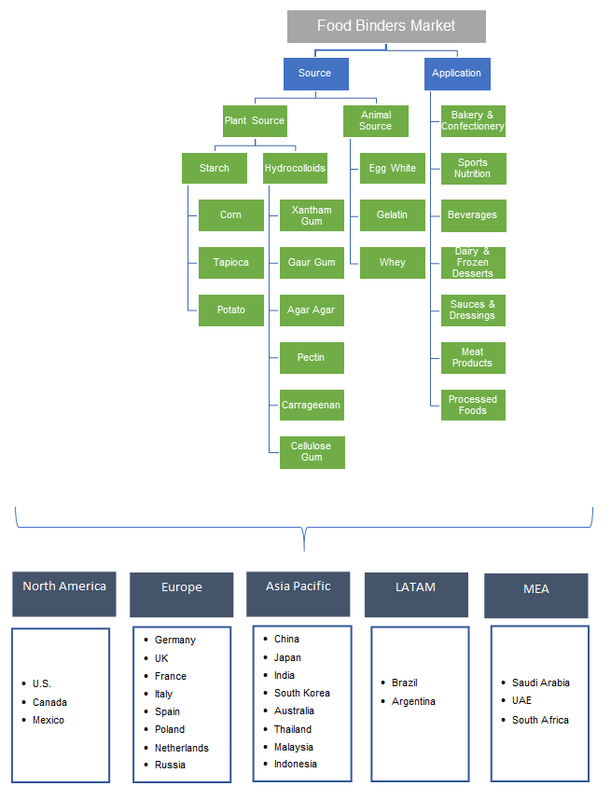 Asia Pacific led by South Korea, India, and Japan food binders market is predicted to witness significant gains up to 5.5% in the forecasted timeline. The product has its applications in chewing gums, potato chips, and candies owing to its bonding properties. Growing urbanization and distribution channels including hypermarkets and convenience stores in the region will have a positive impact on confectionary industry, hence stimulating binding agents market growth. Brazil market may witness substantial growth by 2025 owing to rising meat consumption. Carrageenan, xanthan gum, and whey protein concentrate owing to its fat binding and moisture retention properties has applications in emulsified meat products. Increasing consumption of sausages owing to changing food habits will foster product demand. Global food binders market share is moderately fragmented with major players including Ingredion, Cargill, Archer Daniels Midland Company, Dupont, Tate & Lyle, and Roquette Ferres SA. Companies are involved in strategic alliances including mergers & acquisitions, joint ventures, partnership, and capacity expansion to implement innovative technologies with growth in production capacity to cater rising industry growth. Food binders are added to edible products in order to maintain their shape and binds its constituents. Binding agents can also prevent oil separation in several confectionary products including chocolate spread and confectionary fillings. Plant based binders include gums which are manufactured by boiling plants. Animal-based binders are manufactured by boiling bones, hooves, and animal skin.